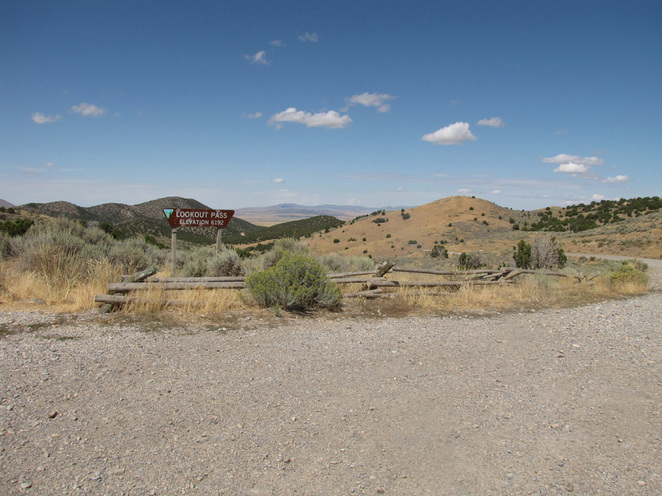 The mineral collecting area is not really at Lookout Pass, which is located along Pony Express and Overland Stage Route, but is 3-4 miles south of the pass itself, along a dirt road through Little Valley that requires high vehicle clearance and perhaps an ax or hatchet to clear tree limbs growing across it. 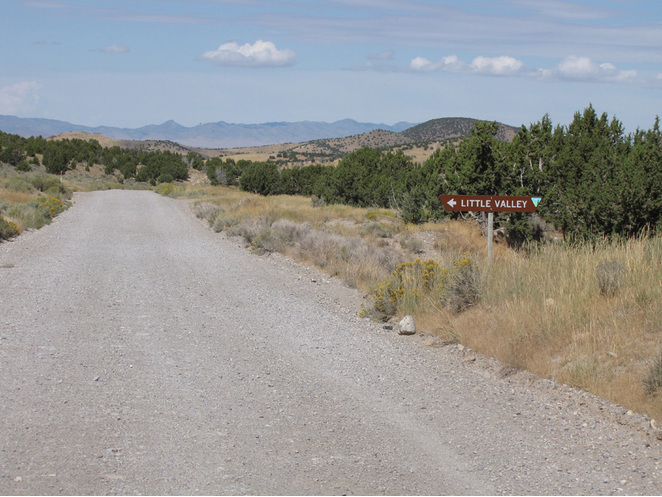 The N-S trending Little Valley is labeled on the USGS topographic map, but “Little Valley” has hardly ever been used to refer to this site. West Lookout Hills and East Lookout Hills are on either side of the Valley, but those terms are not on the USGS topographic map. 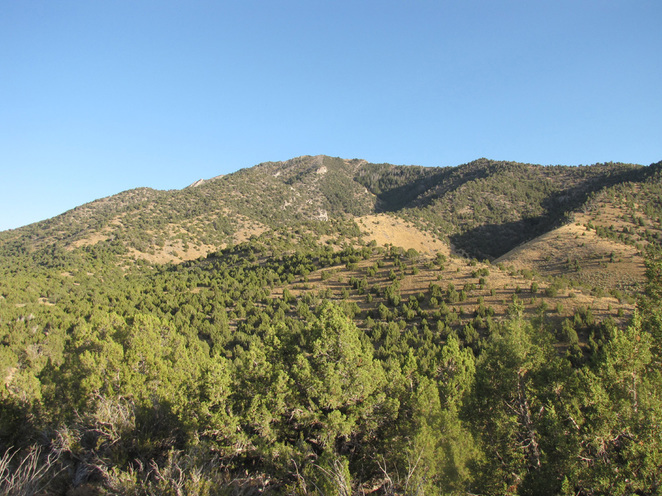 All of these features – East and West Lookout Hills and Little Valley – exist only from the Pony Express and Overland Stage Route for about four miles southward to where the hills and the valley between them lose definition. 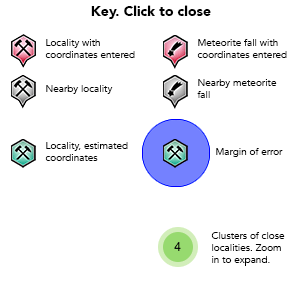 The area of the prospect presently (August 2014) lies between Lat. 40.078 to 40.088 and Long. -112.594 to -112.600, and is in Secs. 26 and 35, T. 8 S., R. 7 W., Tooele County, Utah. 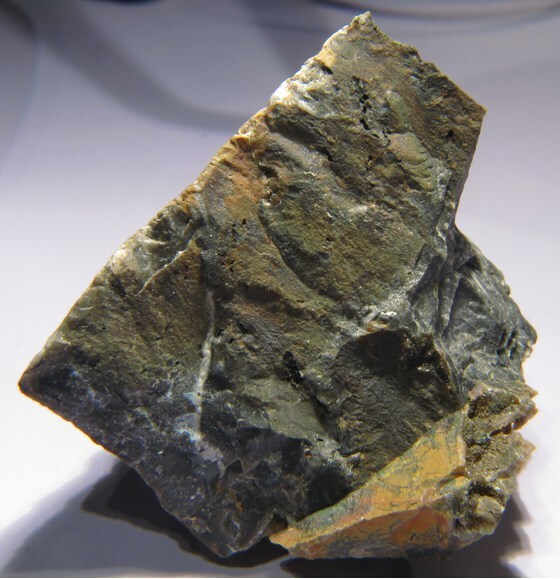 The thallium minerals have been reported from the west side of Little Valley, in foothills forming the northernmost Sheeprock Mountains. Sheeprock Mountains are a horst-block mountain range in the Basin and Range physiographic province. 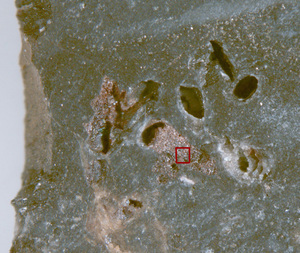 A thick sequence of Paleozoic sedimentary strata ranging in age from late Precambrian to Mississippian is exposed in this area, dipping generally toward the north. 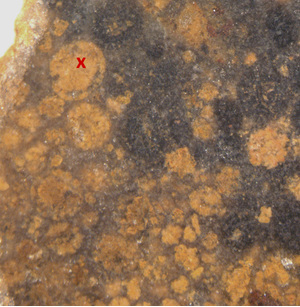 The Cambrian Ajax Dolostone, including shallow-water facies such as oolitic, stromatolitic, and mud-cracked carbonates rich in burrow and crawling marks, forms the host rock. 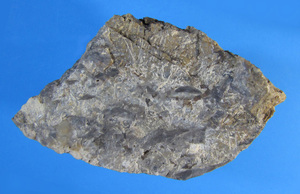 Tertiary decalcification of the carbonates led to extensive brecciation, followed by metasomatic silicification to form a variety of dark-colored (organic-rich) chert known as “jasperoid.” Silicification, mineralization, and concentration of organic material occurred along fault and/or shear zones that cut the strata. The structure in Paleozoic strata is dominated by a conjugate set of shears trending NW-SE and NNE-SSW (green to brown outcrop areas in the geologic map below). The drainage pattern, visible in topographic maps, reflects these trends. The recently active quarry is very near the major, southernmost shear shown on this map. Thallium minerals in jasperoid were discovered here in 1987 near the site shown by the Mindat icon, but closer to the road through Little Valley. 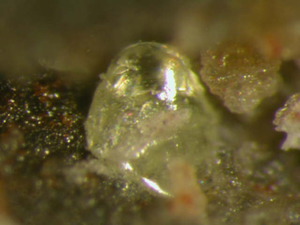 Organic-rich jasperoid containing thallium minerals, radiating sprays of stibnite and stibiconite, and arsenian pyrite suggests this is a Carlin-type deposit, and potential for commercial gold production here has inspired occasional exploratory work. 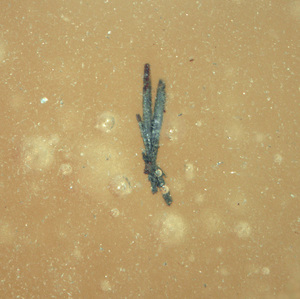 A road for access by drilling rigs was constructed near the original site of specimen collection. 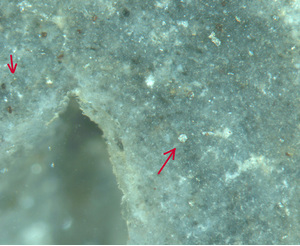 Drill-hole cores taken there registered as high as 0.02 oz gold/ton (reported by Miranda Gold Corporation–see reference). 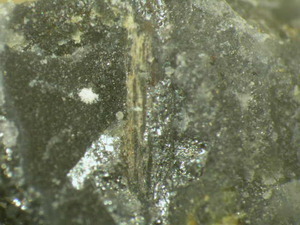 Silver was detected by EDS analyses in two samples collected by Norman King in 2011, but no visible silver has been found. 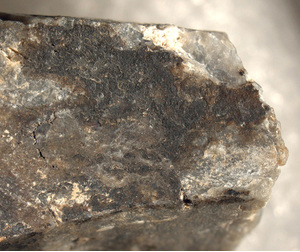 Parapierrotite is the most conspicuous mineral in the dark-gray jasperoid, occurring in isolated, stubby, black crystals up to 2 mm in maximum length. These produce brilliant silvery reflections from cleavage surfaces in bright sunlight. 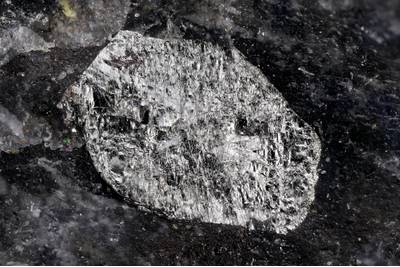 Stibnite is present in similar-appearing cleaved crystals, but these are very elongated and form radiating sprays. 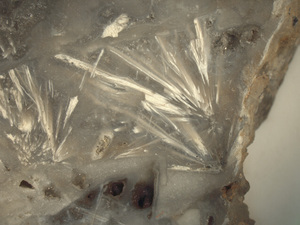 Many of the latter are altered to cream-colored stibiconite. 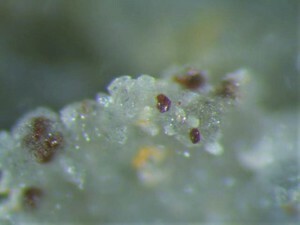 Parapierrotite alters initially to inconspicuous reddish-brown kermesite, and later, more alteration produces conspicuous cream-colored hydroxycalcioroméite pseudomorphs that mimic the parapierrotite crystals. 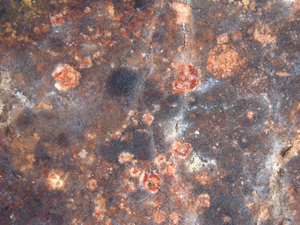 Surfaces of the jasperoid are commonly covered by dull back coatings of the thallium oxide avicennite--another product of the weathering of parapierrotite (thallium is lost during formation of kermesite and hydroxycalcioroméite). 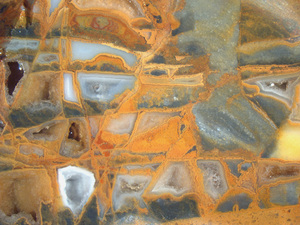 The jasperoid is oxidized in places to reddish-brown color from iron oxides and kermesite, and color banding in the oxidized jasperoid produces what lapidarists refer to as "wonderstone." 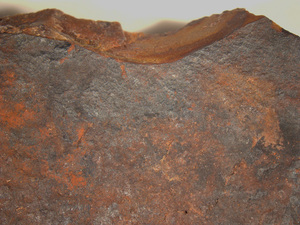 Remnants of still-unaltered parapierrotite (metallic cleavages still visible) can be found locally in the oxidized jasperoid. 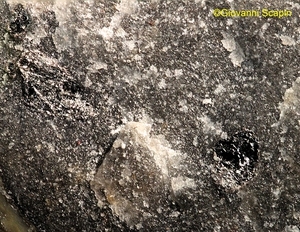 Generally, the darker color, plus brilliant reflections from parapierrotite cleavage planes, are keys to locating the mineralized zones. 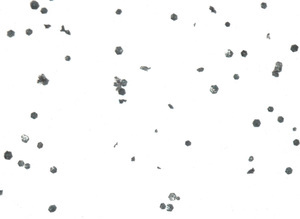 NOTE: Lookout Pass thallium-bearing mineral specimens have a history of little analytical work. Collectors should, therefore, be wary of identities listed on labels. Reference: Norman King; King, N. R. (2014, October). 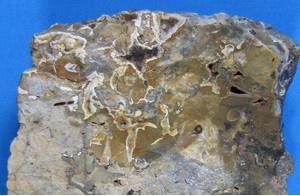 THE MINERAL ASSEMBLAGE FROM LOOKOUT PASS AREA, SHEEPROCK MOUNTAINS, TOOELE CO., UTAH. In 2014 GSA Annual Meeting in Vancouver, British Columbia. 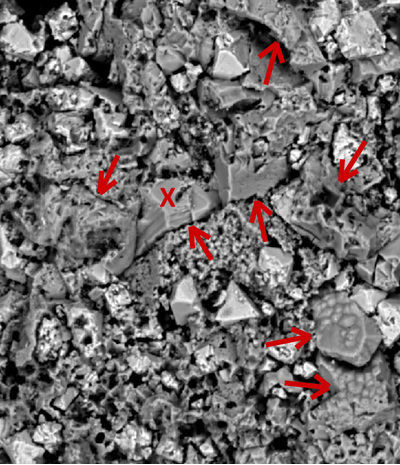 Reference: Handbook of Mineralogy; King, N. R. (2014, October). 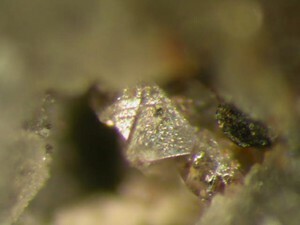 THE MINERAL ASSEMBLAGE FROM LOOKOUT PASS AREA, SHEEPROCK MOUNTAINS, TOOELE CO., UTAH. In 2014 GSA Annual Meeting in Vancouver, British Columbia. 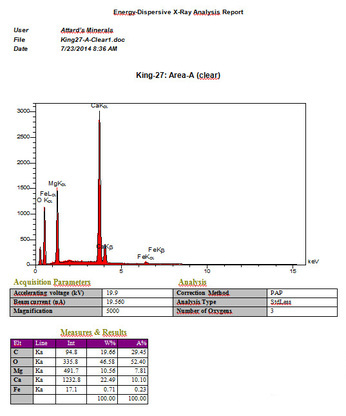 Reference: King, N. R. (2014, October). 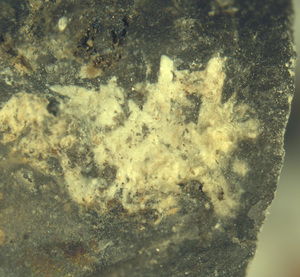 THE MINERAL ASSEMBLAGE FROM LOOKOUT PASS AREA, SHEEPROCK MOUNTAINS, TOOELE CO., UTAH. In 2014 GSA Annual Meeting in Vancouver, British Columbia. Reference: Collected by and in the collection of Brent Thorne. ; King, N. R. (2014, October). 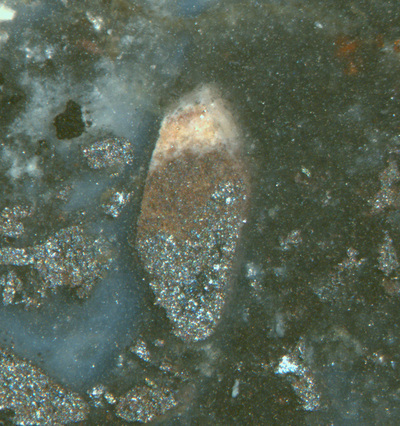 THE MINERAL ASSEMBLAGE FROM LOOKOUT PASS AREA, SHEEPROCK MOUNTAINS, TOOELE CO., UTAH. In 2014 GSA Annual Meeting in Vancouver, British Columbia. Reference: R&M 68:6 p381-393; King, N. R. (2014, October). 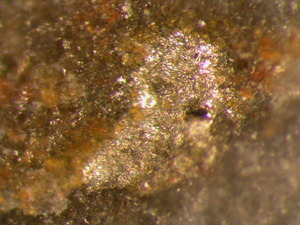 THE MINERAL ASSEMBLAGE FROM LOOKOUT PASS AREA, SHEEPROCK MOUNTAINS, TOOELE CO., UTAH. In 2014 GSA Annual Meeting in Vancouver, British Columbia. 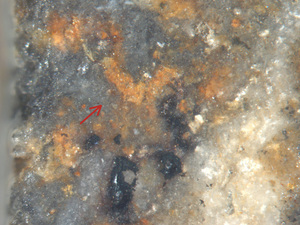 Rocks & Minerals (1993) 68(6): 381-393. King, N.R. 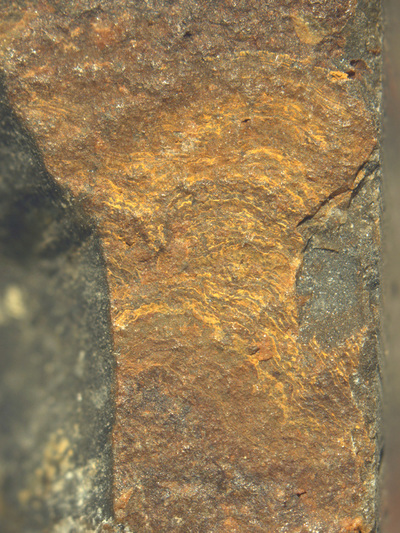 (2014) The Mineral Assemblage from Lookout Pass Area, Sheeprock Mountains, Tooele County, Utah, in 2014 GSA Annual Meeting in Vancouver, British Columbia (October 2014).